Red beets (Beta vulgaris) definitely do not take a serious place in our daily diet, and this is actually not right! These blood red veggies can not be frequently found on our dinner plates, and thinking about adding beets to our daily diet will hardly be associated with positive expectations from the taste of these veggies. However, those who are health-conscious are aware that red beets are among the healthiest natural foods which can improve our physical well being to a great extent! A wide variety of health benefits associated with these red and juicy edible roots, the veggies with no content of saturated and trans fats, very low in calories and with highly effective anti-cancerous properties, should not be ignored and neglected! Especially taking into account the fact that red beets are being cultivated throughout the world and are available in our markets year round. 100 g of this veggie has only 42 kcal. The same amount has 9.7 g of carbohydrates, 1.5 g of proteins, 43 mg of phosphorus, 27 mg of calcium, 10 mg of Vitamin C, 4 mg of niacin, 1 mg of iron, 0.5 mg of riboflavin and thiamine. In addition to that, red beets are considered to be perfect sources of fiber which is essential for good digestion and stronger immunity against cancer. Green leafy tops of the beets should not be thrown away as they are rich in a number of important natural nutrients, including carotene, chlorophyll, potassium, folic acid, and some vitamins. 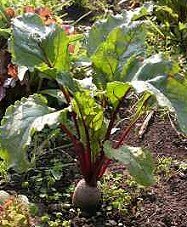 Red beet leafs can be used in cooking (as the ingredients of vegetable soups, salads or other dishes). Beets and health benefits of beets are mentioned in scripts from the neo-Babylonian epoch. It was one of the most valuable foods in ancient Greece, and red beets were given along with sacrifice gifts to the Greek God Apollo. The Greeks and Romans discovered a lot of beets health benefits, including eating giving great energy and serving as a natural aphrodisiac, as well as relieving constipation and improving blood quality by enriching it with natural minerals and sugars. 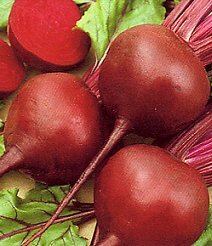 In the 16th century red beets were introduced in Northern Europe, and in the Napoleon epoch the first species of sugar beet as a source of sugar started being cultivated. An outstanding natural food for excellent heart health and blood quality, red beet is also known for its properties to protect liver from possible problems (due to a high content of beatines), and its abilities to prevent respiratory diseases (due to a high content of carotene and vitamin C). According to the specialists from the American Heart Association, beets and beetroot juice consumption is linked to lower blood pressure and stronger capillaries. But, undoubtedly, one of the most important health benefits of beets is anti-cancerous properties of this veggie. Researches showed that regular treatment with red beets or beetroot juice is linked to blocking cell mutations caused by nitrosamines compounds. Beet therapy can be especially effective for lowering the risks of having colon cancer. When talking about beets health benefits, it is impossible not to mention positive effects of this veggie on vision and reducing risks of having cataract (due to a high content of beta-carotene). Betanine has great anti-inflammatory properties and can successfully lower the effects of oxidative stress. Beetroot juice can also assist in combating such problems as headaches, menstrual pains, lumbago, toothaches, skin problems and many more. Finally, beets are highly recommended to be added to a healthy diet of all pregnant women as this veggie is rich in folate and other vitamins from B group, which play a role in preventing birth defects: in particular, lowering the risk of spina bifida. Beets can be really great complements of various dishes and salads, so give this miraculous gift of nature a chance one day! 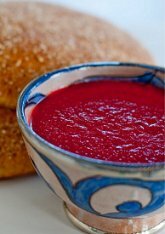 Do not get fooled by its disputable fame as a tasteless piece of flesh: have you ever tried a real Russian Borscht?.. Also, what type of sugar is in Red Beets, fructose or sucrose? According to nutritiondata.com 6g out of an 82g beet is sugar. But according to wiki, Sugar Beets are 60% sucrose by weight, which would put it at around 49g of sugar for the 82g beet! Sure, red beets and sugar beets are different varieties of beets, so you can completely trust Wikipedia on this! About sugar content, what I know for sure is that red beetroots have certain amounts of fructose, the rest you can try to find in reputable editions.